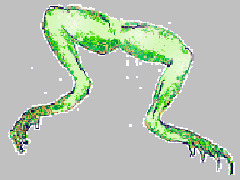 The frog is an amphibian in the order Anura (meaning "tail-less" from Greek an-, without + oura, tail), formerly referred to as Salientia (Latin saltare, to jump). 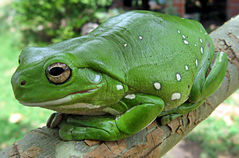 Adult frogs are characterised by long hind legs, a short body, webbed digits, protruding eyes and the absence of a tail. Most frogs have a semi-aquatic lifestyle, but move easily on land by jumping or climbing. They typically lay their eggs in puddles, ponds or lakes; and their larvae, called tadpoles, have gills and develop in water. Adult frogs follow a carnivorous diet, mostly of arthropods, annelids and gastropods. Frogs are most noticeable by their call, which can be widely heard during the night or day, mainly in their mating season. 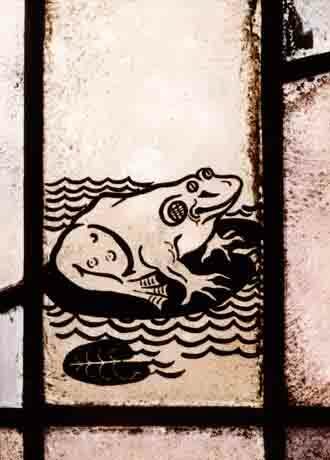 The Frogs is a comedy written by the Ancient Greek playwright Aristophanes. It was performed at the Lenaea, one of the Festivals of Dionysus, in 405 BC. It tells the story of the god Dionysus, despairing of the state of Athens' tragedians, and allegedly recovering from the disastrous Battle of Arginusae. He travels to Hades to bring Euripides back from the dead. He brings along his slave Xanthias, who is smarter, stronger, more rational, more prudent, braver, and more polite than Dionysus. To engage the audience, their first scene consists of a series of base jokes and potty humor in which Xanthias subtly one-ups Dionysus with each line.